Fort Morgan is a scenic 40-minute drive from Orange Beach and Gulf Shores, Alabama, through the coastal dunes to Mobile Bay. Here, this star-shaped architectural wonder has stood guard since 1812 – active during the Civil War, the Spanish-American War and World Wars I and II. Today, visitors to this 479-acre National Historic Site can explore artillery batteries and buildings dating back to 1872 (the oldest belonged to the Lighthouse Keeper), built with more than 40 million bricks laid by skilled masons, many of whom were African slaves. The fort’s unique shape enabled its defenders to direct heavy fire on approaching military fleets in multiple directions, while also thwarting land-based attacks. The fort is most famous for the role it played during the Civil War. It was here in 1864 that Union Admiral David Farragut assembled 14 warships to attack Confederate Admiral Franklin Buchanan’s fleet in Mobile Bay. When one of the Union ships struck a mine, it sent the fleet into confusion. Lashing himself to his ship’s mast so he could see over the smoke, Admiral Farragut yelled “Damn the torpedoes! Full speed ahead!” With this battle cry, he led his fleet into the great Battle of Mobile Bay. 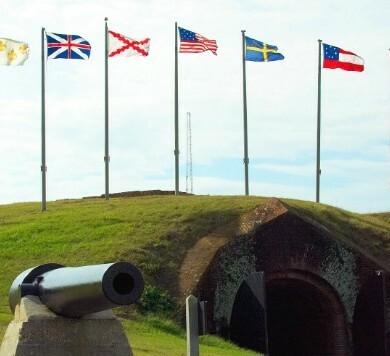 Fort Morgan hosts an annual event commemorating the noteworthy battle, which celebrated its 150th anniversary in 2014. It also boasts an active living history program, interpreting historic events and key aspects of daily life in the fort – right down to the cannon firings. During the summer, you can take daily guided tours, including Civil War twilight tours. However, if you prefer to explore on your own, an excellent self-guided tour is available. Don’t miss the Museum, which highlights American military history in Mobile Point between 1814 to 1945 with exhibits featuring weapons, uniforms, letters, photographs and personal items of the soldiers who served at the fort. You might want to bring your beach gear and binoculars so you can spend the afternoon exploring the nearby shores of the Bon Secour National Wildlife Refuge. Fort Morgan and the surrounding area house globally important bird habitat, located on the annual migration route for Monarch Butterflies and Hummingbirds. In fact, the Hummer Bird Study Group operates a banding station for two weeks every spring and fall, when volunteers capture and band thousands of migrating birds, including the dazzling Ruby-Throated Hummingbird. If you want to make a day of it, hop on the Mobile Bay Ferry to Dauphin Island. Luxuriate in the island beaches and wade the shallow waters of Mobile Bay before departing via the Gulf Intracoastal Waterway bridge. With the Mississippi Sound to the west and Mobile Bay to the east, this view of the wetlands at dusk is worth the extra drive time. For more information, please visit the Fort Morgan website.